For the biological order, see Crocodilia. A crocodile is a large amphibious reptile. It lives mostly in large tropical rivers, where it is an ambush predator. One species, the Australian saltie, also travels in coastal salt water. In very dry climates, crocodiles may aestivate and sleep out the dry season. The modern type of crocodile appeared first in the Eocene period, but its ancestors go much further back, to the Upper Triassic. The name "Crocodile" is also used for any member of the order Crocodilia. They are basically Archosaurs, a group which also includes the dinosaurs. There are many species of Crocodiles including the American, slender-snouted and Orinoco crocodile. The crocodile can snap its jaw shut quickly and with much power. But crocodiles have very little strength opening their jaws and a person could hold the jaw shut with their hands. Crocodiles range in size from African Dwarf crocodiles that measure rarely over 5 feet to saltwater crocodiles which can approach 23 feet. Crocodiles live in rivers, lakes and dams in parts of America, Asia, Africa and Australia. Some of the crocodiles from Australia live in salt water. These saltwater crocodiles are normally bigger than the ones that live in fresh water. While crocodiles spend most of their time in water, they can come out and move around on the land. Crocodiles cannot breathe underwater: they breathe air, just like people. When they are not active, they can hold their breath for a maximum of about two hours underwater before drowning. Normally, when underwater, they are active and can hold their breathe for a maximum of 20 minutes to one hour. Their colors range from brown to grey and have different patterns covering them. They have many shapes and they differ in color. They have sharp claws and teeth. They can also be a greenish-brownish color. Crocodile tongues are not free. They are held in place by a membrane that can not move. Crocodiles are unable to stick out their tongues. Although there is not much difference in their life-style, biologists put alligators in a separate family. Gharials are also in a separate family, and Caimans are a sub-family of alligators. The difference between an alligator and a crocodile is that one can not see the fourth tooth in the lower jaw of an alligator when the alligator's mouth is closed. One can see the fourth tooth in the lower jaw of a crocodile when its mouth is closed. 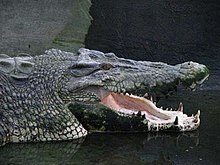 ↑ "Crocodilian Biology Database - FAQ - How long can a crocodile stay underwater?". crocodilian.com. Wikispecies has information on: Crocodylidae. Man shares bungalow with crocodile. BBC News. This page was last changed on 27 March 2019, at 21:16.